Composting enthusiasts take heart! 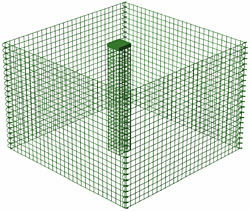 The reliable Pilot Complete Coated Mesh Wire Compost Bin is up to the task of converting your scraps for many years. With the manufacturer's 22-year warranty, you can be sure this composter won't go the way of the dodo bird. This bin is constructed from PVC-coated 12-gauge steel.